Solo Bass Word Association – Help, Please! As y’all know, I’m a big big fan of Bandcamp – it is, at the moment, the best self-service MP3 sales platform on the entire internetz. 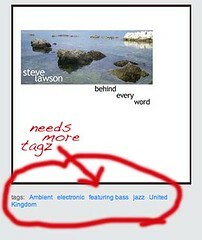 They’ve just implemented the option to have artists, albums and tracks tagged with genre, location and associated words… Making it searchable. So, this is where you come in – I’m interested in what you associate with my music when you listen to it. It can be a genre description, or a feeling, or something far more random. The floor is wide open. Actually, those are the kind of questions that come up in my world fairly often. Trying to categorise the uncategorisable (sp?) is too often a requirement. Aggressive, Angry, Atmospheric, Awesome, Bittersweet, Bleak, Brash, Bright, Brooding… (etc). Atmospheric, Dreamy, Elaborate, Gentle, Lush, Mellow, Poignant, Rich, Silky, Slick and Versatile. There are other descriptions I’d apply to individual works that would include Emotional, Inspirational, Melancholy, Sad and Thoughtful. This might not be what you’re looking for, but I hope it helps. Atmospheric, laid back, introspective, thoughtful, relaxing. Enveloping, music to work to, calming, relaxing, cocooning, meditative, thoughtful, provoking – I was listening to behind every word while I was writing a document – got distracted by the tweet of course!